In the winter of 1814 Jan-Baptist Victoor (married to the widow of J.F. Lebbe) left the town of Poperinge to settle in the forest of Sint-Sixtus to spend the rest of his life as a hermit. 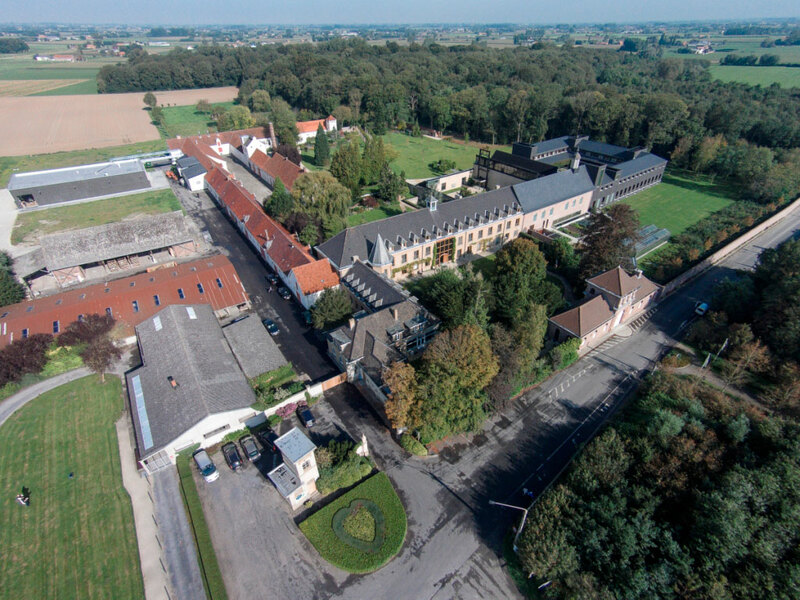 In earlier times and only a few hundred meters from his new hermitage there used to be two monastic communities there: from 1260 until 1355 the so-called ‘sisters of the house of Sint Sixtus’ and from 1615 until 1784 a community of monks of the Birgitine order. 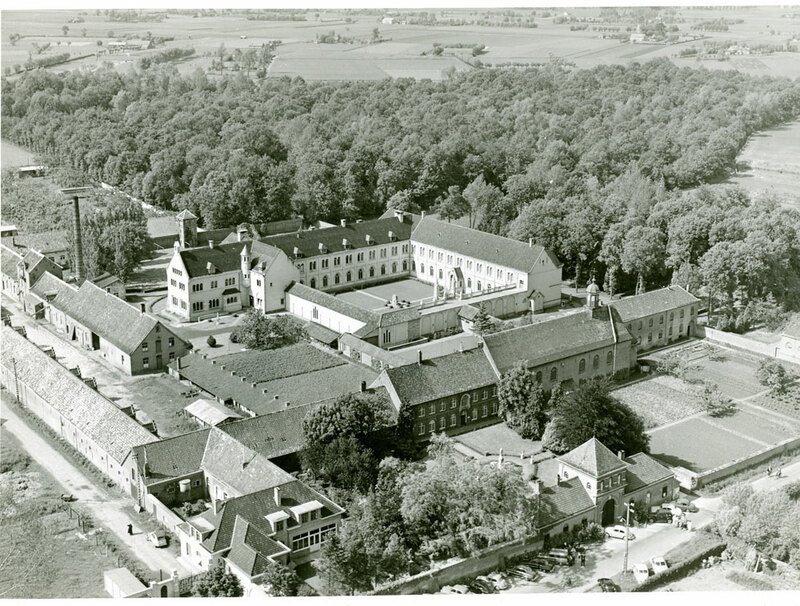 When in the summer of 1831 the prior of the recently founded monastry of Catsberg and a few of his monks joined the hermit, a new Cistercian abbey was born. 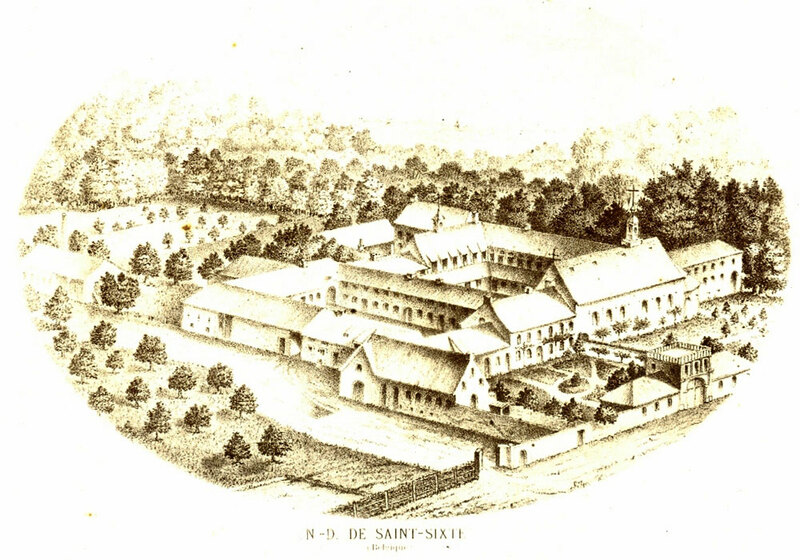 The foundational years of this Cistercian establishment (1831-1836) were difficult. Nevertheless there was a steady growth of the community. There were 23 member in 1835 and 52 in 1875. Twice the community released monks: in 1850 16 brothers went to Scourmont to found a daughter house and, during the years 1858-1860, around twenty brothers were sent to Canada to induce new life in the flagging monastery of Tracady (the contemporay Spence in the U.S.). Other important happenings during this first period were the building of the abbey church in 1840, the foundation of a primary school around 1840, the commissioning of the first brewery in 1939, the donation of the monastery grounds by the Lebbe family in 1860, the elevation of the priory to abbey in 1871 and the extension of the farm to a business model for the area in 1875-1878. 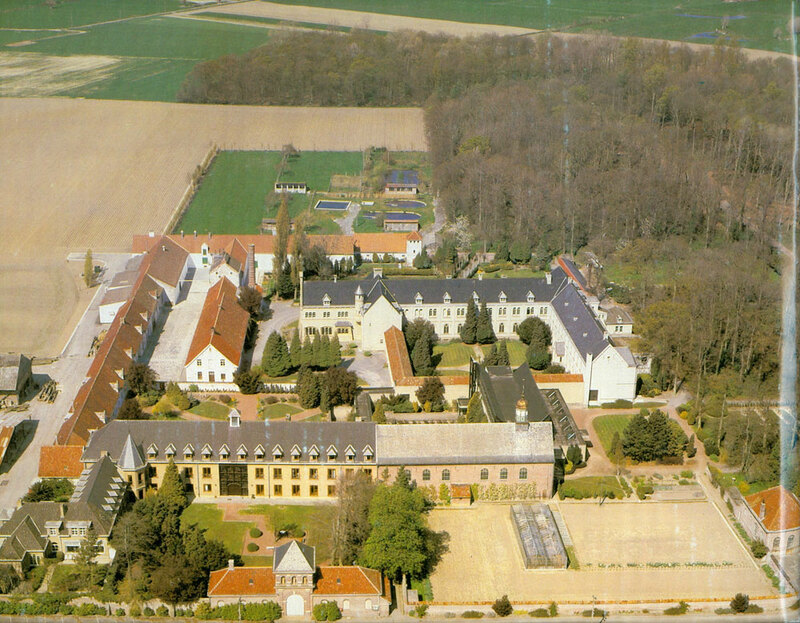 During the First World War hundreds of refugees stayed in and around the abbey as well as almost 40.000 allied soldiers. The Second World War proved to be a precarious time economically, politically and on the level of the order. Humanly spoken there was much suffering. At this moment it is too early to judge and value all of this objectively. 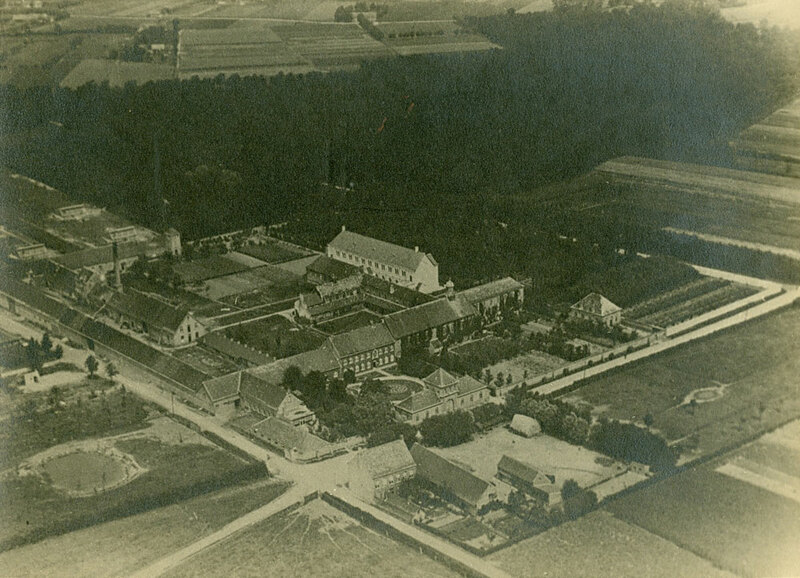 – The former abbot Dom Gerardus Deleye (abbot from 1941 till 1968) took in 1945 the far-reaching decision to reduce the ever growing brewery to smaller proportions. With her yearly production of round and about 6000 hectolitre the brewery still is a small business. – The building of the guesthouse in 1964. In the light of the previous period and certainly for the community at that time it can be called ‘spacious’. It illustrates the importance the community gives to hospitality: openness to the outside is an essential element of our monastic life. -. The other essential pole of Cistercian life, that is the ‘seclusion’, received form through the building of the present abbey church in 1968. A timeless, modern church that does complete justice to the centuries old tradition of Cistercian architecture. This church increases the seclusion for the monks. She is only accessible for guests and people who ring the doorbell at the abbey gate. The unstable condition of the living quarters of the monks induced new building work in 2008-2011. Part of the abbey was pulled down and a new more spacious building was erected, designed by Bob Van Reeth. The former abbey church was reallocated towards a library and dining area. The new abbey church and what remained of the earlier together with the chapter house, scriptorium, noviciate, communal area and sick-bay joined the monastery square. On the first level there are rooms for the brothers and in the cellar working areas. The guesthouse was also rebuilt. As a result of the increasing secularisation in our society the abbey has had fewer vocations than before. However, by means of the new abbey buildings the community does give a clear sign that it meets the future in trust. This is our most profound faith: We are in God hands.